On Tuesday, February 21 the Daniel Guthrie Indiana Sons of the American Revolution Chapter held its quarterly meeting. RBBCSC School Board President and Ellettsville Town Marshal, Jimmie D. Durnil was awarded the Law Enforcement Commendation Medal and Certificate. Melea Shockney, a junior at Edgewood High School was also in attendance and received a monetary award and certificate for winning the George S. and Stella M. Knight Essay Contest. Edgewood High School students Emily Headdy and Kelsey Lavendar were the first and second Runner-Up in the essay contest, respectively. Students at Edgewood High School came up with the idea to make Chrismas brighter for residents at the Richland Bean Blossom Health Care Center. Members of the Student Council, Key Club, and National Honor Society all worked together to wrap 78 shoe boxes for some of the residents. Students from the Consumer Science Department made cards to go with the gifts. Photo courtesy of Cassey Gilley of the Ellettsville Journal. Our EHS Choral Department, enhanced by the sixth ranked show choir program in the entire state (and thirty-fifth in the country), is proud to bring you the latest production of 'Tis The Season, our annual holiday spectacular! This year, over 200 students from ALL of our RBBCSC schools will be represented! You will have two opportunities to catch this yearly winter tradition - December 3rd at 7:00PM, and December 4th at 2:00PM. Tickets are available at the door ($6.00 for senior citizens; and $6.00 or $8.00 for general admission - depending on seating location). There is no reserved seating. Thank you and we'll see you at the show! Thursday, September 22 is Parent/Teacher conference day. There will be NO school for students on Thursday. School will resume as usual on Friday. If you have not yet scheduled an appointment with your child's teacher, we urge you to do so. Great News, School Mobile Apps Are Available! School Apps are in! Apps show social media feeds, LMS and Harmony Access, contact information, school lunch menus, ECA calendars, and much more. Would you like to work on Google Docs when WiFi is down or you don't have WiFi at home? This short 2 minute video will show you how to change settings in Google Drive and allow you to work without WiFi. Then the next time your Chromebook accesses WiFi and you open the document, all edits and work will be saved! Welcome Back for Another Great Year at RBB! The first day for teachers and staff is Wednesday, August 3rd and the first student day is Thursday, August 4th. We look forward to the start of the 2016-2017 school year. Below are important dates concerning registration and Chromebook rollout for returning EJHS and EHS students. July 28 from 2-8 P.M.
Parents/students should come early to avoid long lines! RBB Schools partners with the Monroe County Energy Challenge to promote energy efficiency! Richland-Bean Blossom Community School Corporation is dedicated to becoming a catalyst for positive change in the community and is increasing our commitment by joining the Challenge as a Workplace Partner. The Monroe County Energy Challenge (MCEC) is a broad coalition of community organizations collaborating to reduce energy use in Monroe County. MCEC was created in response to the Georgetown University Energy Prize, a nationwide, two-year energy savings competition. Monroe County is one of 50 communities competing to reduce electricity and natural gas use by using innovative, broad-reaching methods. The winning community will receive $5 million in prize money to further promote energy efficiency projects in the community! We support this goal and recognize that everyone can benefit from increased energy efficiency and lower monthly bills! We will be supporting MCEC by sharing monthly tasks that can help reduce energy bills by up to $500/year and offering easy energy saving tips! Can’t wait to learn more? Go tohttp://mocoenergychallenge.org/ and sign up for direct emails, or check out their facebook page: MoCo Energy Challenge. The Executive Session scheduled for Monday June 13, 2016 has been cancelled and will not be rescheduled. 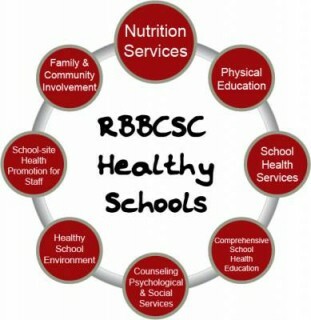 AdvancED External Review Team Recommends 5-Year Accreditation for RBBCSC! During the week of April 25th, our school corporation was visited by an AdvancED External Review Team as part of our accreditation process. Accreditation is a rigorous evaluation process that involves internal and external review. The school has met a set of standards developed by AdvancED that offer education providers of all types a framework for school and corporation improvement. Our schools and corporation have agreed to regular self-reviews and reviews by outside evaluators to check our ongoing progress. During the external review visit, the team met with members of our school board, heard presentations by our administrative team, spoke with parents and community stakeholders, observed classrooms across all buildings and grade levels, spoke with students and staff, and met with building leadership and school improvement teams. In addition to the onsite discussions with stakeholders and observation of our daily practices, the External Review Team also worked off-site each evening to review our school and corporation self-assessments and supporting evidence to affirm our positive practices and confirm our areas for improvement. On Wednesday, April 27th, the External Review Team met with the RBBCSC School Board of Trustees in a work session to share their work and the results of the review. I am pleased to announce that the AdvancED External Review Team has recommended that the Richland-Bean Blossom Community School Corporation receives AdvancED Accreditation for a 5-year period. The corporation will soon receive a detailed report identifying our Opportunities for Improvement and Improvement Priorities to guide us in our continuous improvement process. The External Review Team was complimentary on the accuracy and honesty of the areas our school and corporation-level committees identified as strengths and weaknesses. I want to take a moment to thank our Corporation Committees, School Committees, building administrators, and all other staff members and stakeholders who were part of this process. The administrative team will share next steps and actions as we continue to move forward in our continuous improvement process. Please feel free to contact my office with any questions about our process. To demonstrate education quality, accreditation is used by a wide range of education providers, from traditional schools to distance learning providers to tutoring centers, serving all ages of students from toddlers to adults. Accreditation provides school corporations with the tools and the know-how to ensure students are college- and career-ready. Do students have everything they need to optimize their learning? Are students prepared to succeed in college or their career? An AdvancED accredited school corporation has access to valuable resources and tools that provide answers to these questions and more. A school is equipped to better identify and implement strategies for improvement giving you peace of mind that your child is attending a school that cares about quality. What are the benefits for students attending an accredited school? Next to a parent, a teacher is one of the most influential figures in a student's life. So as parents, you want to know that teachers are working all the time to improve the learning opportunities for your child. An accredited school corporation pays attention to providing its schools and teachers the resources and tools to succeed in the classroom. An accredited school corporation is committed to offering students a rigorous, diverse and sound curriculum instructed by qualified teachers. Students also are eligible for special programs, grants and scholarships. In celebration of Every Kid Healthy Week, please join us for our first annual community health fair and dinner on Wednesday, April 27, 2016 anytime between 5:00-7:00 p.m. Everything is FREE of charge. This event is for all Richland-Bean Blossom students, families and community members. The health fair will be held in the back parking lot area between Edgewood Intermediate and Edgewood Primary School, rain or shine as we will move indoors if rain is in the forecast. Parking is available in the back of the buildings, front of the buildings, and additional parking at the Junior High School basketball lot area. We will have over 45 booth vendors with fun activities, giveaways, and prizes. We will have several health experts available. We will have exercise demos including Jazzercise of Ellettsville, PIYO with Bloomington Beach Bodies, and the IU Dance Exchange. Your free dinner includes a Grilled or Breaded Clux Deluxe Chicken Sandwich or Chicken Smackers, a Fresh Salad Bar, Chips, Fresh Fruit or a Cookie, and Bottled Water. RBB Schools engages in a process of continuous quality improvement as a means for review and refinement of the services and operations it provides is students, staff, families and community. Part of this process includes an elective accreditation process through AdvancED - an international accrediting organization. The accreditation process involves an onsite review of our corporation operations and professional practices through an External Review process. During the week of April 25th, RBB Schools will host an External Review Team consisting of educators from various parts of our nation including Indiana. Over the course of their visit, the External Review Team will spend their time learning about our school corporation through meeting with faculty and staff, interviewing parent and community stakeholders, visiting our schools and conducting classroom walkthroughs to gauge student engagement. In our self-assessment process, corporation committees identified various artifacts aligned with each of the AdvancED Standards of Quality. This evidence is available for public viewing on our corporation website. You may access our Standards-aligned evidence here. If you have any questions about our accreditation process, you may contact Jason Bletzinger, Assistant Superintendent, at 812.876.7100 extension 2177 or jbletzinger@rbbschools.net. RBBCSC "Find your fit" Community Health Fair Block Party on Wednesday, April 27, 2016 from 5:00-7:00 p.m. Free food, free fun, free fitness, come "find your fit".